Why rent a condo, when you can vacation in your own beachside Hawaiian home? AFFORDABLE AND CLEAN are the keywords for this tropical beach house. Situated on a half-acre, our "feel like home", yet cost-effective 3 BR, 2-1/2 bath beach home has it all: granite counter tops; flat screen TVs and DVD players in each bedroom and living room; designer tile; glass brick shower; intimate indoor jacuzzi; state-of-the-art appliances; beautiful teak wood furnishings and a custom A/C system in each bedroom and living/dinning/kitchen. Each room has it's own A/C control in case you want air conditioning in your room and another person in a different bedroom does not. Watch the whales, in season (November-April), while you dine. Recline on teak furnishings and enjoy sunsets over the water and mountain from your front window and/or covered patio with patio table and chairs and chaise lounges. Spread a blanket on the lush lawn, play bocce ball with your family and grill fresh fish on the large gas-fired BBQ. Just down the beach are surfing lessons, cozy farmers markets, Island bakery, shave ice shop (snow cone) local style food, romantic restaurants and shopping galore. Stay in our comfortable and CLEAN beach front home for a Hawaiian vacation that you will never forget! Refresh after your day at the beach in top-of-the-line bathroom accommodations; featuring two full baths with showers and a half-bath adjacent to the kitchen. Glide into a hot jacuzzi for a whirlpool bath, or rinse off in the glass brick walk-in shower. Thanks to our 'on-demand' tankless hot water system, there's always plenty of hot water for everyone. All bathrooms are appointed with designer sinks with high-end faucets. Nice family beach, no "drop-off" when you enter the water or further out, no broken coral to hurt your feet or seaweed either in the water or on the beach. Nice snorkeling 200 yards out. Walk out your front door, across the small frontage road, and you're on beautiful Sugar/Kihei Beach. Full views of Maalea Bay, Island of Lanai and West Maui Mountains. 48' flat screen TV with cable/DVR in living area; flat screen TVs and DVD/VCR in bedrooms. This tropical waterfront home is equipped with the very finest amenities. Flat screen cable TVs and DVD/VCR players, a custom A/C system, movie and book library, free wireless internet, covered parking, granite counters, hand carved teak furnishings, quality beds, mattresses and linens. Allow us to pamper you. We have gone the extra mile to ensure that your Hawaiian vacation is the best ever! Many thanks to Linda and Harry. It was a nice stay at their home. Not very crowded area but also close to where you want to go. The home had all the little things like straws!!! and big things like the grill. The location of this house is perfect. it is out of the tourist fray but still close to everything. the house itself is cozy. The kitchen has a wealth of supplies. After a long delay at the Budget Car Rental we were warmly greeted by Linda and Harry and given a tour of home and all the amenities. The rooms were airy and clean. They also gave us access to boogies boards, paddles boards along with all the beach items we would need. This was greatly appreciated as renting these items would have been costly. We enjoyed the fresh bread and the goodie basket as well! The home in both directions is close to other cities and all the shopping we needed. We enjoyed the church chicken dinner and the shaved ice shop just north of us. We loved the easy access to the beach, drivers were very cordial in letting us cross the road with ease. The beach and ones down the road were not packed with people, which we really appreciated. Lots of room to sun bath and enjoy the water. We spent a good deal of the evenings on the private patio watching the water for whales and the beautiful sunsets. 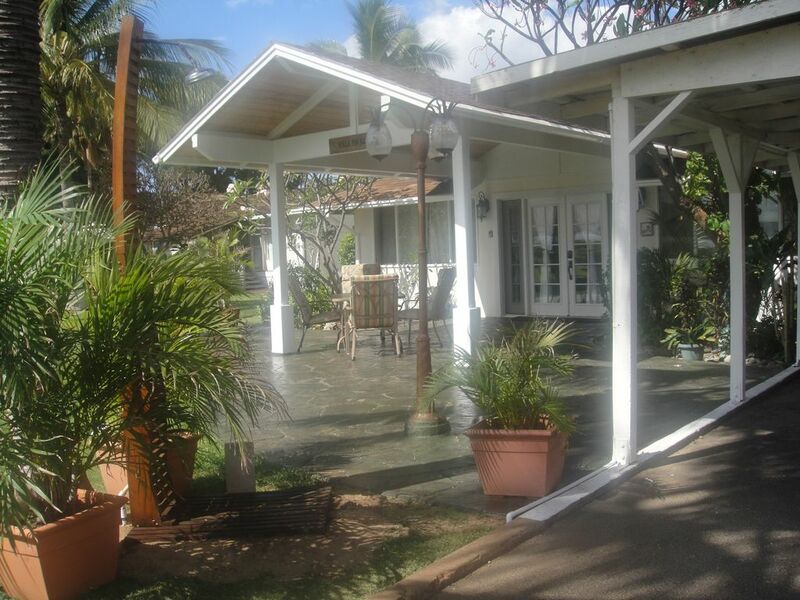 We definitely would rent from them again as well as recommend this home to anyone planning on visiting Maui. Our hosts gave us our privacy but did check in from time to time to see how we were doing. Our first visit to this beautiful island was a success and we attribute a big part of that to Linda and Harry. Great location and house, too many extras to cover them all! Beach access, full kitchen and yard. Linda is a great hostess and is available for advice or any issues. We loved our stay!! We stayed at Linda and Harry's place in Feb 2019. We were very happy with the location and hospitality of our hosts. They greeted us when we arrived and gave us a tour of the home and a lovely gift basket of local goodies. They we very accommodating as we were late due to issues and delays at the car rental agency. They were happy to tell us all about the great places to eat and visit during our stay. We loved hearing their stories about Maui. The place was fully stocked with everything we needed for our time there. We would definitely recommend this place if you are traveling to Maui. We were there with our adult children, six people in total, and there was more than enough room and privacy for all of us. We will definitely be back. Thanks Harry & Linda for a wonderful stay. It was great getting to know you. Kihei is a wonderful small island town. Vacationers often say that they feel like 'locals' when they stay in Kihei. A relaxed setting, with warm seas and soft sands, Kihei is a tiny paradise that is favored by those seeking to avoid the pricey and impersonal resort scene. Exellent restaurants, scenic vistas, quiet streets and friendly people are what makes Kihei special. The required deposit is NON-REFUNDABLE. Balance is due 14 days prior to your arrival. Cancelled bookings will receive back the BALANCE, ONLY IF we are able to re-book your dates.